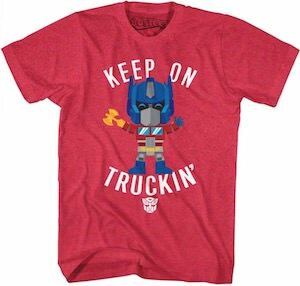 Now there is a fun Optimus Prime Keep On Truckin t-shirt that is a must-have for true fans of Transformers. The red t-shirt is available in men’s sizes Small – 2XL. On the Transformers shirt you can see a comic style Optimus Prime and as we know he transforms into a truck and that is why it shows the text “Keep On Truckin'” and even the Autobot logo. 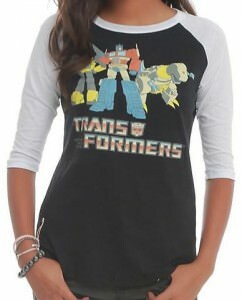 Now you can have the Transformers t-shirt everyone wants because it is fun and unique. So show the world Optimus Prime by wearing this amazing red t-shirt that looks like a cartoon and that is fun. 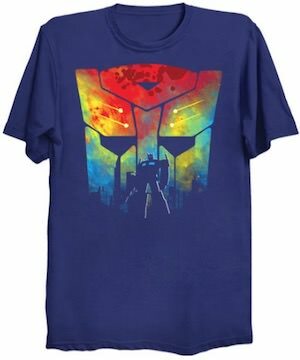 This t-shirt is a sublimation t-shirt and that means that the design is fully covering the front and back of this Transformers t-shirt and that includes the sleeves. On the background you can see a Transformers comic and on the back the t-shirt has a big Transformers logo and on the front you can find Optimus Prime and he says “Optimus Prime Is Back!” and that of course is good for all the Autobot’s. 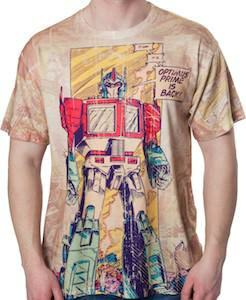 You can get this Optimus Prime t-shirt in sizes Small – 3XL and all look as awesome as the picture. So if you like comics and Transformers then come check out this Transformers Optimus Prime Comic T-Shirt. Autobots from Cybertron is where it is at! Why not dress as the only leader, be Optimus Prime the next time you don’t feel like being yourself or have a costume party to attend. This fantastic and realistic costume looks like Optimus Prime in his robot form. Colorful with blue, red and silver as the main colors, you will be the hit of the party and the talk of the town. This costume comes with a printed jumpsuit, a helmet for a mask with light up eyes, chest piece, hip piece, and gloves shaped like gauntlets. Watch out lady Transformers fans because Optimus Prime is coming to you on a cute dress. This cool Optimus Prime dress features the robot look of the Transformer Optimus Prime from the Transformers movies. 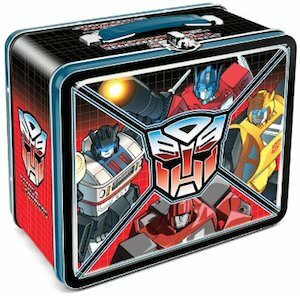 It has a blue skirt with a red stripe at the bottom with a red short sleeve at the top and in the chest and waist area shows Optimus Prime’s face. It is made of 95% cotton, 5% spandex and is available is a wide variety of sizes from Small to 3XL. You could dress up as the powerful Transformer Optimus Prime at your next Halloween party or you can just wear is as a everyday dress. 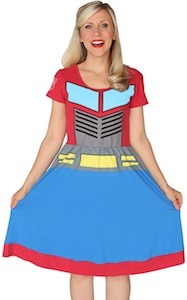 Transform your style and wear this cool Transformers Optimus Prime Dress. 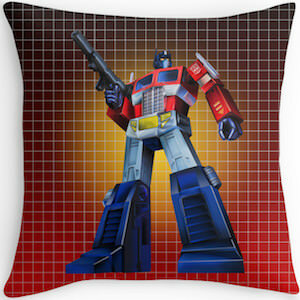 How cool would it be to have Optimus Prime on a pillow on you couch or bed? It think it would be pretty neat to have that. You are in luck because now there is a pillow that show Optimus Prime in battle mode ready to act and he is standing in front of a G1 style grid in red with a yellow core. This Transformers pillow comes in 3 sizes and is also is available as just a pillow cover. Now you can cuddle on the couch while watching Transformers on TV. Come and take a closer look at this Transformers Optimus Prime Pillow. Do you remember playing with Transformer toys when you were a child? Was your favourite Optimus Prime the of Autobot ? Now you can dress your own baby in this cute bib and hat set that will remind you of those days. This light blue bib has a simple red, white and blue picture of the body of Optimus Prime and the dark blue beanie hat has a printed armour pattern with raised areas over the ears to look like earphones. So sit back and relax while you and your little one, dressed in this cute costume, watch the latest Transformer movie. 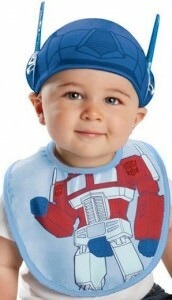 Transform your own baby into one of the most popular images of the 1980’s with this Transformers Bib and Hat.